Are you tired of messy ketchup packets? Heinz, the ketchup company, was and decided to clean up its image by creating a unique new package. 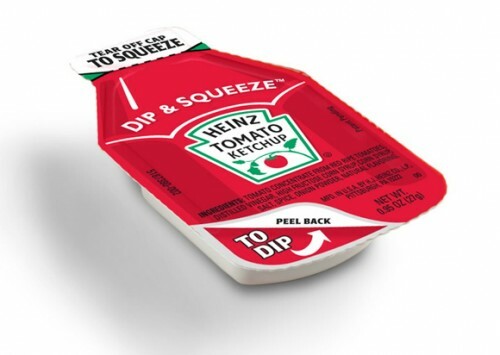 Heinz Dip & Squeeze, was first introduced in restaurants like Dairy Queen and Chik-fil-A earlier this year. The new packets give people two choices for Heinz Ketchup use. One could peel back the label to dip, or tear off the top if you want to squeeze some ketchup on your food. The new packets also provide people with three times more ketchup than the older version. The new design has a familiar face. It’s shaped like a Heinz bottle with the same signature red color and familiar tomato vine and logo. The ketchup will be available in packs of 10 with a suggested retail price of $1.99. Will you buy into the ease of this new product, or run the risk of wearing red with those old packs? From a packaging design standpoint, I can see the appeal here, with the ability to squeeze or dip. It’s nothing short of revolutionary. That said, does this design use more materials, therefore making it more wasteful? That’s my only concern here. As for the bottle, ah yes, the bottle. In packaging design, the bottle has always been held up as the ultimate container. Ketchup packets, as well as cans of soda, have often depicted a bottle. Will you ever see a bottle with a depiction of a packet on it? Not likely. The bottle wins.